If you’re a small business owner, you’ve probably contemplated different financing options for your business. But which financing type is best for your company and its current stage of growth? 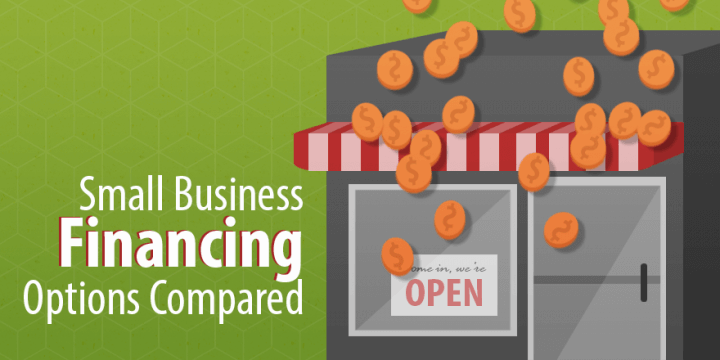 Here’s a brief summary of the most popular types of small business financing options, highlighting the pros and cons of each. By far, the most common type of small business financing is the term loan. The basic term loan is highly standardized, regardless of industry or sector. Your small business borrows a specific amount of money and agrees to repay that money over a set period of time using fixed interest rate payments. Thus, for example, you might take out a 10-year term loan for $1 million to finance a major new equipment purchase. Over a period of 10 years, you would pay back the full $1 million (the principal) in addition to interest payable on that $1 million. There are a number of factors that go into choosing whether or not this is the right type of financing for your business. One key factor, of course, is the interest rate that you will be paying. This rate is determined based on two key factors: the overall creditworthiness of your business and general market conditions. Thus, during a low interest-rate environment, you could expect to receive a more favorable rate than during a highly inflationary period. Business lenders will want to look at your tax returns and bank statements, and they will also want to have a very good idea of why you are borrowing the money. Is it to finance a major equipment purchase? Keep in mind – these term loans can be secured or unsecured. An unsecured loan is similar to a credit card – you are not putting up any property, equipment or inventory as collateral; instead, you are putting at stake your personal financial assets. A secured loan is viewed as being “safer” by a lender because they will have easier recourse (i.e. seizing your collateral) if you fail to pay back a loan. Within the past decade, online credit marketplaces and other non-bank lenders have largely taken over the role traditionally played by community banks. In other words, instead of heading down to Main Street to meet with a local banker, small business owners are checking out online lending marketplaces or obtaining financing via lenders such as Small Business Lending Source (www.smallbusinesslendingsource.com). Next in popularity for small businesses is the line of credit. With a line of credit, small businesses receive access to a specific amount of money that they can use on an “as needed” basis. You can think of this as being similar to the maximum amount that you can borrow on a typical credit card – most people will borrow just a small fraction of the amount that they can. The reason is simple: borrowers pay interest on the amount they borrow and use, not on the amount available. Thus, if you have a $1 million line of credit, you may only be borrowing $200,000 of that total. There are several other differences between a term loan and a line of credit. With a term loan, you are paying back interest with a fixed rate. However, with a line of credit, you are paying back interest with a variable rate. In a rising rate environment, your cost of borrowing will go up over time. Conversely, in a falling rate environment, your cost of borrowing will go down. Moreover, lenders will continually re-evaluate how large the size of your line of credit should be. For example, if you take out a line of credit with Small Business Lending Source (www.smallbusinesslendingsource.com), a sustained uptick in your company’s sales or a change in your overall financial strength could lead to an even higher line of credit. The U.S. Small Business Administration (SBA) makes available special loan programs for small businesses that may not meet traditional lending requirements due to their industry, size or time in business. An important point to consider here is that SBA loans still come from banks or other lending institutions (such as Small Business Lending Source); however, what is different is that the SBA is a financial intermediary, helping to guarantee your loan. This SBA guarantee gives banks and other financial lenders the peace of mind that they are not just lending to a small business – they are lending to a small business backed, in part, by a federal agency. As you might imagine, getting this sort of guarantee from the U.S. government is not easy. There is a long and complex application process, but the results are well worth the time. Many small businesses face temporary cash flow crunches, and to help them out, independent third parties known as factoring companies (“factors”) will offer to buy up their outstanding invoices in exchange for giving them cash. Thus, imagine that you have a number of invoices payable in 60 or 90 days but you have immediate cash flow needs due within the next 30 days. You could sell your outstanding invoices to these companies, which are experts at collecting accounts receivable. In exchange, you would receive 75-90% of the value of those invoices immediately and the remainder of the value (less any fees) once these invoices have been fully collected. Of course, there are a number of other financing options for small businesses. If your small business has many customers that pay via credit card, for example, you could get a merchant cash advance. This works similarly to the invoice factoring arrangement, in which you would receive immediate cash for a percentage of overall credit card sales. Or, if your small business invests heavily in equipment and inventory, you could receive an asset-based loan based on the amount of collateral that you are willing to put up. For example, say that you run a bakery and some of the equipment needed in the kitchen suddenly breaks down. In order to avoid closing down business until you could afford the new equipment, you could arrange to get a loan based on the value of the equipment (which would act as collateral). If you look at the website for Small Business Lending Source (www.smallbusinesslendingsource.com), you can see examples of different financing options discussed in greater detail.